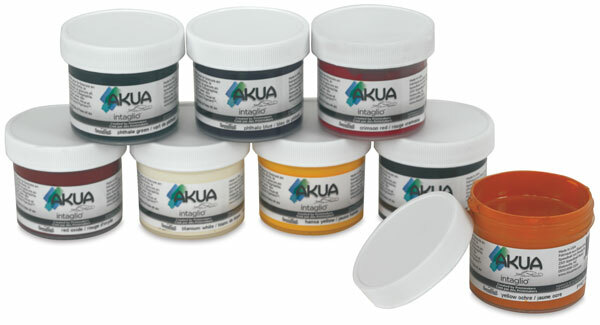 Akua Intaglio soy-based permanent inks are a non-toxic, environmentally safe way to do printmaking. Formatted for intaglio, they can also be applied with a brayer for relief, monotype, and collagraph printmaking techniques. Combine Akua Intaglio Ink with Solarplate for a completely waterbased intaglio process. Akua ink has a rich, thick consistency with minimal dryer and cleans up easily with soap and water. Print from plastic, wood, linoleum, or metal plates. You don’t need any special ventilation, toxic solvents, or fireproof containers. 8-Color Sampler Pack — Colors include Hansa Yellow, Yellow Ochre, Crimson Red, Red Oxide, Carbon Black, Titanium White, Phthalo Green, and Phthalo Blue. Jars are 59 ml (2 oz). Metallic Gold and Silver Inks — Use Akua Intaglio Metallic Gold and Silver Inks when you want to add high shine or a subtle sheen. They’re ideal for monotype, intaglio, and relief printmaking. The metallic colors will appear different depending on the viewing angle. They can be used alone or mixed with other Akua Intaglio or Akua Kolors to create copper, bronze, and other new colors. A small amount added to the ink will increase the opacity without causing a shiny effect. ® Akua is a registered trademark. Akua Intaglio ink combines artist-grade pigments in a soy-based binder creating a permanent ink that is non-toxic and environmentally safe. No special ventilation, toxic solvents, or fireproof containers needed! It cleans with soap and water. And colors are intense and bright.